Hi there! 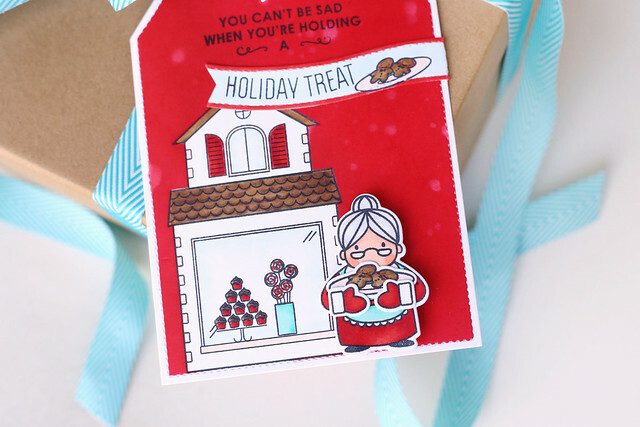 I'm here and on the Mama Elephant blog today, to show off the brand new "tags a lot" die. I went bananas when I first saw this tag set. If you're thinking who needs another tag set - the answer is you do. this one. The oversized tag is making my life. 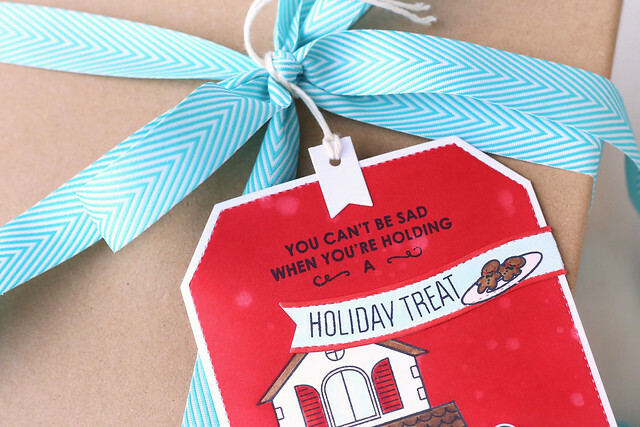 Who needs holiday cards when the tag is card-sized? Fantastic. I combined the following sets for my tag: toy shop, cozy christmas, and carnival toppers. You can't be sad when you're holding a holiday treat is my new fave. I did some selective inking to achieve this sentiment. Forget cupcakes! Gimme a plate of gingerbread cookies, please. I stamped the toy shop directly onto the tag, masking it and the tag's edges to be able to sponge on the rich, red ink. I like the pop of white around the outside of the tag! I also created a bit of a bokeh effect by splattering water onto the tag. The red distress ink reacted with the water and gave this great effect. In front of it all, Mrs. Claus is standing out front passing out free samples. I hope you like it! I'll be back tomorrow with a Cozy Christmas card. EEEK!!!!! How awesome! Huge tags! 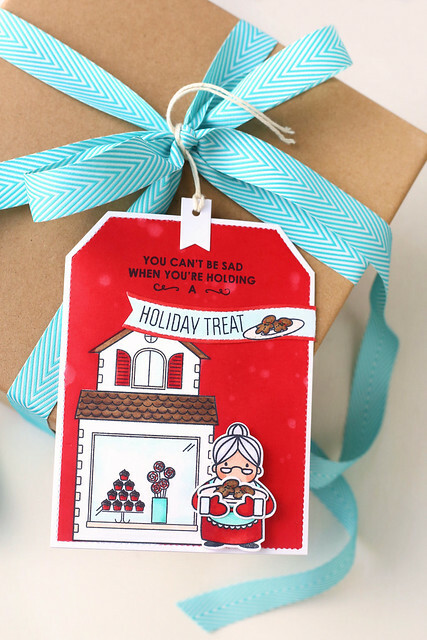 I love, love, love this, and your design is just the cutest ever for Christmas! LOL, I Pinned this in 3 places on my Pinterest boards: Mama Elephant, Tags, and Christmas! So cute! Love this scene you created, and it's true. If I had a holiday treat I wouldn't be sad. I might be chunky, but not sad. Ha! I love this little scene! I think I might need to make another order next month! All the new releases are killing me! Your tag is absolutely adorable! Oh, this is absolutely SWEET!!! LOVE it! LOVE how you mixed all the different sets together!! beautiful tag! I LOVe the large scale!